The winners of this year’s best farm and rural attractions were announced at the National Farm Attractions Network annual conference and awards ceremony at the Edinburgh Corn Exchange on 30th January. NFAN is the trade association for the farm attractions sector with over 250 members. 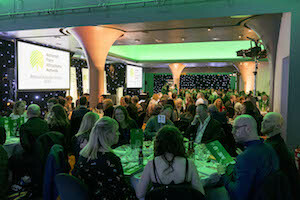 The NFAN annual awards, the Farm Attraction ‘Oscars’, were held at a glittering dinner hosted by Scottish Radio and TV presenter Arlene Stuart. The Winner of the Large Farm Attraction of the Year (over 75,000 visitors pa) sponsored by Marsh and Co and AXA XL Insurance was Puxton Park, Somerset. The winner of the small Farm Attraction of the Year (under 75,000 visitors pa) sponsored by David Taylor Design went to Pink Pig Farm in North Lincolnshire. Other winners on the night were White Post Farm, Nottinghamshire which won both the Best Digital Presence sponsored by Vennersys and the Innovation award sponsored by Marsh and Co. Rand Farm Park in Lincolnshire won Best in Education sponsored by Jumping Pillows, and Odds Farm Park in Buckinghamshire won the best Food and Beverage award sponsored by Booker Wholesale.